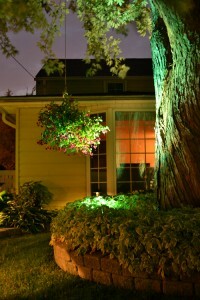 Buffalo-NiagaraGardening.com > Garden Walks > Go on a garden walk, diagnose your veggies & lots more! Go on a garden walk, diagnose your veggies & lots more! View from Parkside Garden Tour 2011. Photo by Connie Oswald Stofko. Summer begins and so do the garden walks! What an exciting week: Tomorrow is officially the first day of summer, and garden walks start this weekend! 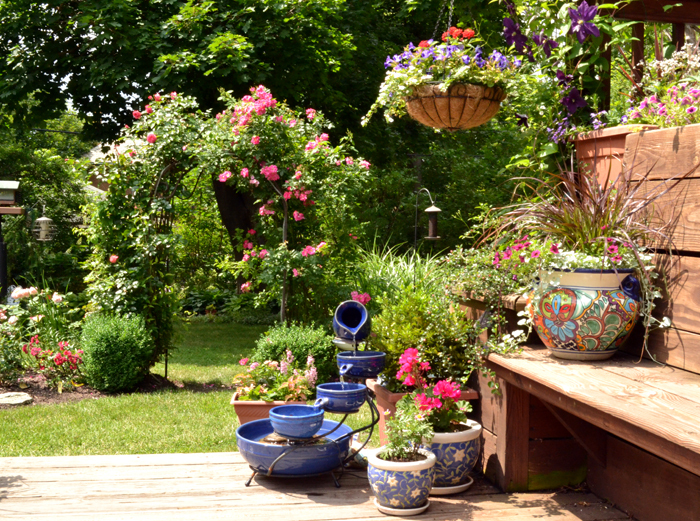 Kicking off the garden walk season is the free 7th annual Lewiston GardenFest, which will be held from 10 a.m. to 5 p.m. Saturday and Sunday, June 23 and 24. Part of Center Street will be closed and lined with vendor booths from area nurseries, landscapers and garden and outdoor suppliers. You can pick up maps for the garden walk in that area. Enter the container garden contest, which will be judged by the public. Sally Cunningham, author, gardening expert and garden host for WIVB’s Wake Up, will speak at 11:30 a.m. on Saturday, and Jackie Albarella, gardening expert and garden host for WGRZ TV will speak at 11:30 a.m. Sunday. Also this weekend, the 15th annual Parkside Garden (and Architecture & History) Tour will be held from 10 a.m. to 4 p.m. Sunday, June 24. Pick up maps at the Church of the Good Shephard, 96 Jewett Parkway, Buffalo. There is a $5 suggested donation. There will be a Parkside audio-visual presentation at 10:30 a.m. and 12:30 p.m. and an architecture guided walking tour at noon and 2 p.m. The Parkside Garden Tour is sponsored by the Parkside Community Association. Don’t miss the inaugural Buffalo-Style Garden Art Sale to be held during the Parkside Garden tour from 10 a.m. to 6 p.m. Sunday, June 24, at the Parkside Lodge in Delaware Park, 84 Parkside Ave., Buffalo. In addition to the artist booths, the event will feature the Western New York Hosta Society’s Hosta Show and Judging and “Plant Society Avenue,” a section with members of area garden societies who will be available to answer gardening questions. In addition to the garden walks, the National Garden Festival offers many events, including open gardens, motor coach tours, the Front Yard Contest and talks & workshops. 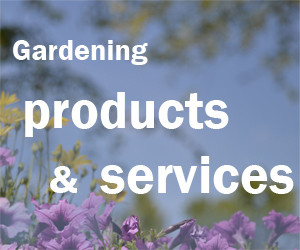 See our Upcoming Events Page for a listing of gardening activities by date. Bacteria on tomato. Photo from Cornell University. Vegetable MD Online was developed to provide access to the many Vegetable Disease Fact Sheets produced over the years by Media Services at Cornell University. The addition of color photographs enhances the use of these sheets for plant disease diagnosis. By clicking on Diseases by Crops on the sidebar, seed packets of your favorite vegetables appear, and by clicking on the crop of interest, a listing of the current fact sheets available is displayed. Magnification of the photos provided in each sheet is possible. A link is also provided to the Photo Gallery, which provides additional photographs not appearing in the original fact sheet. 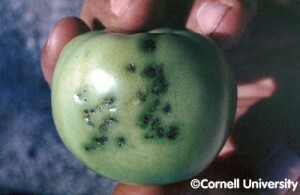 For a fee, you can also send a specimen to Cornell’s Plant Disease Diagnostic Clinic for analysis. In addition to diagnosing plant disease, information on the site also helps you prevent plant disease by helping you choose varieties that are resistant to disease. Saturday Night Lights during Ken-Ton Garden Tour in 2011. Photo by Connie Oswald Stofko. During Kenmore Garden Week, the Kenmore Village Improvement Society is sponsoring a series of free talks at 7 p.m. at the Kenmore Village Green, which is the area in front of the Municipal Building, 2919 Delaware Avenue, Kenmore. Please bring a lawn chair. In case of rain, the talks will be held inside the Municipal Building. Thursday, July 19, “Growing Your Own Delicious Organic Vegetables & Using Worm Power for Better Flowers and Produce” by Solveig Hanson. Also part of Kenmore Garden Week is the 10th annual Ken-Ton Garden Tour. It will be held from 10 a.m. to 4 p.m. Saturday and Sunday, July 21 and 22, with a night tour on Saturday from 8:30 to 10:30 p.m. Look for a guide to the gardens here. The Kenmore Village Improvement Society is also sponsoring the second annual Kenmore in Bloom from June 25 through July 8. The village is divided into 12 zones with at least two bloom scouts per zone. 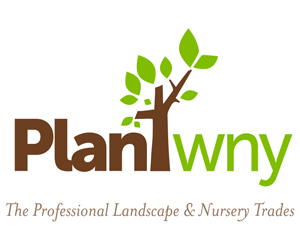 The scouts look for colorful, well kept plantings in the front of a home or business. Each zone may “bloom” approximately 33 places this year –over 400 in all! When someone is bloomed, a Kenmore in Bloom sign is placed in their garden and they receive a bag of information hung on their door, including an invitation to the Bloom Breakfast held on July 14. At the breakfast, one garden from each zone will be announced as a Garden of Distinction. The 12 winners receive nice prize baskets. “We’re finding that people are making special efforts to fix up their front gardens because of Kenmore in Bloom, adding to the curb and street appeal of the Village,” said Melissa Foster, president of the Kenmore Village Improvement Society. Rain always seems to be in the forecast for tomorrow, but then tomorrow rolls around and the rain doesn’t show up. Don’t forget to water, especially if you have container plantings. They get dried out more quickly than garden beds. To keep your plants watered adequately while conserving water, consider installing an underground sprinkler system. 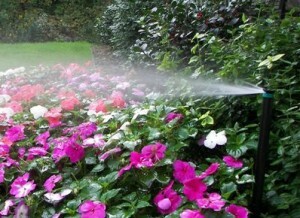 You can get a free estimate from American Irrigation. Buffalo-NiagaraGardening.com will be one of the exhibitors at the Citybration Festival @ Canalside, so stop by and say hello! We’ll be there from 10 a.m. to 4 p.m. Sunday, June 31 at Canal Side Park, 1 Naval Park Cove, Buffalo. The Festival @ Canalside is part of Buffalo Citybration, a four-day event that showcases Buffalo’s assets, highlights opportunity and celebrates the city’s many successes. It will be held from Thursday through Sunday, June 21 to 24. Thursday: Buffalo Waterfront Photography Contest Exhibit Opening, the Buffalo Shuffle and Twilight Tour of Mansions. Friday: Sunset Reception at City Hall, Hot Air Balloon Rides and tours. Saturday: Scanvenger Hunt; Floating Cocktail Party and Boat Parade; 24 Hour Musical Festival; Hot Air Balloon Rides; The Ride for Roswell 2012; Artists, Authors, and Architect, Buffalo Living Tour and other tours. Sunday: Festival @ Canal Side; Citybration 5K Race and Fun Run; Cheerios vs Chicken Wing Challenge on the Boardwalk; Buffalo Public School Alumni Reunion; Waterfront Bike Rides; Hot Air Balloon Rides; Artists, Authors, and Architect, and tours. Garden Walk Buffalo is looking for volunteers to help out during the walk from 9 a.m. to 5 p.m. Saturday and Sunday, July 28 and 29. Photo from Garden Walk Buffalo. Volunteers help answer questions for an estimated 60,000 visitors, encourage donations, help visitors with their purchases of garden walk merchandise and direct visitors to areas of the walk that they may find of interest. You do not have to be an expert on Garden Walk Buffalo or plants to volunteer. 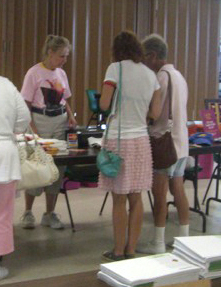 A volunteer orientation session will be held in early- to mid-July. A private mini-tour of Garden Walk Buffalo gardens, by bus, during the volunteer orientation session. You’ll receive a volunteer limited edition version of the 2012 Garden Walk Buffalo T-shirt. You’ll receive a 2012 Garden Walk Buffalo poster. If your volunteer hours happen over lunch time, lunch is included. Volunteering counts as community service for a 501(c)3 organization for schools, community groups, and corporations. You’ll be an ambassador for Buffalo and make visitors’ experience to the area enjoyable and rewarding. Find out more online or to sign up, email GardenWalkBuffalo@yahoo.com. Wow, what an informative post! I will see you maybe at both Lewiston and Parkside. I hope to get to Parkside at some point. I am the roving photographer at Lewiston, so I do get to all the open gardens in Lewiston and all the events they present, plus have a little freedom during the day. Sally’s talk will be on Garden Walks in our area, so it would be great for those attending to hear her and see her presentation. I’m glad you liked the post. I was afraid the amount of information would overwhelm people, but I didn’t want to leave anything out, either. I tried to make it easy for people to skim so they could find the information that was important to them. I’ll be in Lewiston on Saturday, and I’m really looking forward to it. Sunday will be Parkside and Citybration. It’s the first of many busy weekends!